What is DPI in the printer. This post will help you know what DPI stands for and help during your purchase decision. DPI stands for "Dots per inch", it is one of the most important specifications to look when deciding to buy a printer. The DPI can affect the quality of a printed document, lower dot per inch document can be a bad quality document, while higher dots per will make a good document quality. 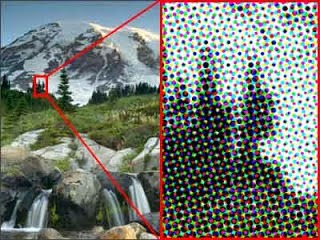 The image on the right is a zoom in part of the image on the left, as you can see the closer the image get you can clearly see the DPI. To have a better resolution image or picture, you will need to choose a printer with a higher number of DPI. 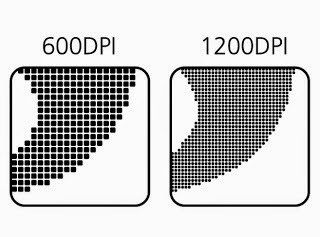 For example, the image above shows us the comparison of 6000 DPI and 12000 DPI image, the 12000 DPI appears to be more consistent and precise with defined curved. This tells us that when we send to print an image with a 600dpi printer will get a square image with more curves than with a 1200dpi printer, with the latter able to image the precise, defined and more defined curves. The higher the DPI the more time it will take to print documents. Some printers even have 2400 DPI resolution, there mostly in laser color or photography printer. en.Rellenado: What is DPI in the printer.